Polly is a loop optimizer for LLVM. Starting from LLVM-IR it detects and extracts interesting loop kernels. For each kernel a mathematical model is derived which precisely describes the individual computations and memory accesses in the kernels. Within Polly a variety of analysis and code transformations are performed on this mathematical model. After all optimizations have been derived and applied, optimized LLVM-IR is regenerated and inserted into the LLVM-IR module. The standard LLVM pass pipeline as it is used in -O1/-O2/-O3 mode of clang/opt consists of a sequence of passes that can be grouped in different conceptual phases. The first phase, we call it here Canonicalization, is a scalar canonicalization phase that contains passes like -mem2reg, -instcombine, -cfgsimplify, or early loop unrolling. It has the goal of removing and simplifying the given IR as much as possible focusing mostly on scalar optimizations. The second phase consists of three conceptual groups that are executed in the so-called Inliner cycle, This is again a set of Scalar Simplification passes, a set of Simple Loop Optimizations, and the Inliner itself. Even though these passes make up the majority of the LLVM pass pipeline, the primary goal of these passes is still canonicalization without loosing semantic information that complicates later analysis. As part of the inliner cycle, the LLVM inliner step-by-step tries to inline functions, runs canonicalization passes to exploit newly exposed simplification opportunities, and then tries to inline the further simplified functions. Some simple loop optimizations are executed as part of the inliner cycle. Even though they perform some optimizations, their primary goal is still the simplification of the program code. Loop invariant code motion is one such optimization that besides being beneficial for program performance also allows us to move computation out of loops and in the best case enables us to eliminate certain loops completely. Only after the inliner cycle has been finished, a last Target Specialization phase is run, where IR complexity is deliberately increased to take advantage of target specific features that maximize the execution performance on the device we target. One of the principal optimizations in this phase is vectorization, but also target specific loop unrolling, or some loop transformations (e.g., distribution) that expose more vectorization opportunities. Polly can conceptually be run at three different positions in the pass pipeline. As an early optimizer before the standard LLVM pass pipeline, as a later optimizer as part of the target specialization sequence, and theoretically also with the loop optimizations in the inliner cycle. We only discuss the first two options, as running Polly in the inline loop, is likely to disturb the inliner and is consequently not a good idea. Running Polly early before the standard pass pipeline has the benefit that the LLVM-IR processed by Polly is still very close to the original input code. Hence, it is less likely that transformations applied by LLVM change the IR in ways not easily understandable for the programmer. As a result, user feedback is likely better and it is less likely that kernels that in C seem a perfect fit for Polly have been transformed such that Polly can not handle them any more. On the other hand, codes that require inlining to be optimized won’t benefit if Polly is scheduled at this position. The additional set of canonicalization passes required will result in a small, but general compile time increase and some random run-time performance changes due to slightly different IR being passed through the optimizers. To force Polly to run early in the pass pipleline use the option -polly-position=early (default today). Running Polly right before the vectorizer has the benefit that the full inlining cycle has been run and as a result even heavily templated C++ code could theoretically benefit from Polly (more work is necessary to make Polly here really effective). As the IR that is passed to Polly has already been canonicalized, there is also no need to run additional canonicalization passes. 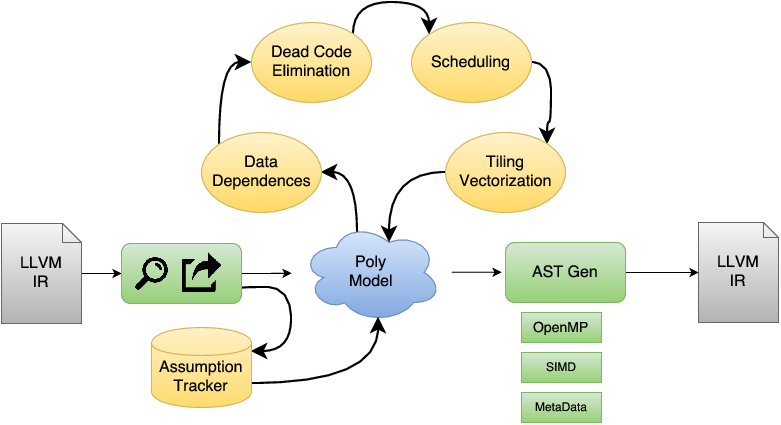 General compile time is almost not affected by Polly, as detection of loop kernels is generally very fast and the actual optimization and cleanup passes are only run on functions which contain loop kernels that are worth optimizing. However, due to the many optimizations that LLVM runs before Polly the IR that reaches Polly often has additional scalar dependences that make Polly a lot less efficient. To force Polly to run before the vectorizer in the pass pipleline use the option -polly-position=before-vectorizer. This position is not yet the default for Polly, but work is on its way to be effective even in presence of scalar dependences. After this work has been completed, Polly will likely use this position by default. © Copyright 2010-2017, The Polly Team. Created using Sphinx 1.5.1.